Welcome to our first ever #doclifer story. 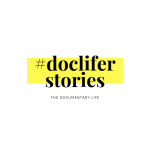 In the spirit of connectivity and togetherness of the documentary filmmaking world (which is the essence of why we started the TDL podcast) we are bringing you stories from #doclifers – doc filmmakers like you and I – from around the world. If you’re interested in contributing your story to #Doclifer Stories, we’d love to hear from you. Your contribution will help to foster the TDL mission of building a supportive and networked community of doc filmmakers throughout the world. #1. – How & why did you first get interested in documentary filmmaking? Since I was sixteen, I always wanted to become a journalist. After working for a local radio station as a reporter / DJ / host, I found my way into TV journalism and did a job training as a video journalist for several years. During this time, I did well over 300 short pieces for television (portraits, news, etc.). Six years ago, I started my own production company (RainWater Media), doing mostly freelance camera work for companies, producing image & product films for start-up companies and such. My main goal has always been to work as a full time documentary filmmaker, combining my passion for images, film and stories. And like many, I got heavily influenced by the documentaries I’ve watched over the years. #2. – What was your first experience making a documentary film like? Well, I think I’ve never made it easy on myself. Instead of filming a small, personal story right in front of my door in northern Germany, I decided to take my equipment to southern Thailand and document the life of a mahout and his elephant in the jungle. I only planned for five shooting days (way too short!) and lost one complete day due to sound issues with my lavalier mic, which I couldn’t solve. Besides that, it was a great and very emotional experience for me. I learned, after so many years producing, that you can plan, you can prepare, but in the end you often end up with something far different from what you had planned. Prepare for the unexpected, I guess! #3. – What have you learned about making a documentary film that you wished you’d known before? I think after every doc project you learn something completely new about yourself. For me there is no end to the road of mastering your skills and developing your own look & feel. But what stands out – often in quite different ways – is the fact that you have a vision as a filmmaker and it is hard to plant this vision into other peoples’ minds. Protagonists, assistants and everyone you meet on the way of making your film don’t have the same, strong passion and clear vision you have and you always have to be aware of that. Try to enchant people with your passion, show them that you don’t want to harm them in any way and always be open about nearly everything. I wish I would have known that a bit earlier. #4. – What’s a big challenge or hurdle you’ve had to overcome in leading a #doclife? Because I work in the industry, the biggest challenge for me is trying to maintain a balance between doing paid jobs for my clients and unpaid doc projects for myself. Luckily, I am blessed with a lot of clients who have always offered me jobs over the years. But I have to be strict with myself to save up some money and to be able to spend this money on passion projects. Of course the main goal is that one day, two becomes one, and I will be able to make a living as a full time documentary filmmaker– like most of us #doclifers would like to! #5. – Share a current or most recent project with us. As I am writing this, I am right in the middle of production for my current DOC project in Thailand. Mainly, my documentary will be about the region of Nakhon Nayok, an often overlooked and completely unknown province to western tourists. I had the unique chance of witnessing old, traditional buddhist ceremonies, like house blessings and monk ordinations, which normally are closed to the public. At the same time, it is a character driven story about one of my best friends, who is Thai and is building his own resort in Nakhon Nayok at the moment. We experience his every day life, as well as get to know the people close to him. 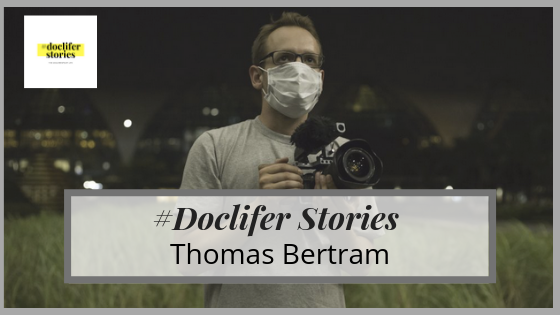 Thank you to Thomas Bertram for sharing his #doclife with our community. In the spirit of connectivity and togetherness of the documentary filmmaking world we are bringing you stories from #doclifers – doc filmmakers like you and I – from around the world. If you’re interested in contributing your story to #Doclifer Stories, we’d love to hear from you.